Wm. K. Walthers, Inc., was founded in Milwaukee in 1932 — but it really started on Christmas Day in 1899 when seven-year-old Bill Walthers found his first wind-up toy train waiting under the tree! 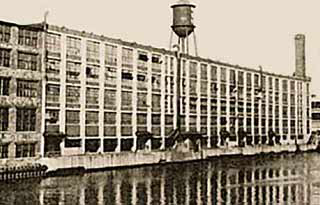 Milwaukee was a hotbed of railroading and technology in the early years of the 20th century, and Bill made the switch to electric trains over the years. His standard-gauge attic layout became a test-bed for his ideas and inventions to improve operation, which he shared through how-to articles in early hobby magazines. As letters arrived asking for advice, Bill self-published what may have been the hobby’s first how-to book, the Signal and Control Manual for Model Railroaders. But as hobby shops were unheard of, many folks were unable to purchase supplies locally and began writing to see if they could buy directly from Bill. The idea of turning his hobby into a business began to take shape, leading to the very first Walthers ad in the in the May 1932 issue of The Model Maker (forerunner of today’s Railroad Model Craftsman). Offering a 24-page catalog for 15¢ listing rail, couplers and electrical supplies, sales were over $500.00 for the first year, and the fledgling company was off to a strong start. Sales boomed during those Depression years as folks sought low-cost ways to have fun at home. By 1937, operations had to move from the family home to larger quarters in the Erie Terminal Building, where all of the O Scale milled-wood parts, metal castings, decals and more were made and packaged in-house. Production soon ramped up with the introduction of the first HO Scale models, which were also featured in their own catalog that year. The 1939 New York World’s Fair introduced thousands of people to the hobby through the biggest operating O Scale layout built to that time, which featured cars and locos supplied by Walthers. Success was soon overshadowed as WWII brought a halt to most model production. Walthers soldiered on making decals and what little else it could from non-essential materials. By 1943, they were scraping the bottom of the barrel - literally - in a series of famous ads explaining the difficulties obtaining supplies for the duration. While the postwar years were filled with promise, smaller homes and growing families left little room for O Scale railroads, and HO quickly gained in popularity. In 1958, Bill retired and his son Bruce took over, and just as full-size railroads were hard-hit by new technology, so too were model railroads. Leisure time was spent with TV sets, not train sets and many distributors simply abandoned the hobby business. Walthers took a different track, becoming a full-line distributor of other manufacturers’ products in 1960 while continuing to develop its HO and O Scale lines. In 1972, Bruce’s son Phil joined the company as Wholesale Division President, becoming President in 1984 when Bruce retired. Under Phil’s guidance, Walthers began an unprecedented program of expansion that would eventually include HO plastic freight cars, Code 83 Track and Cornerstone structure kits. With hobbyists embracing home computers and the Internet as modeling tools, Phil’s own interest in the new technology played a key part in the design and development of walthers.com, which was launched in 1994. During much of this time Stacey Walthers-Naffah, oldest of Phil’s four children, often came in on Saturdays to help her father and grandfather. In later years, she worked in the Distribution Center and spent one summer as an intern in the Publications Department. Following college and a career in marketing and advertising, Stacey officially became the fourth generation of the Walthers family to join the business in 2009. Over the years, she held the positions of Consumer Marketing Manager, Vice President of Marketing Communications and Vice President of Sales and Marketing, becoming President in 2018 following Phil’s retirement. Walthers is on track for the future, dedicated to helping you find the information, supplies and equipment you need to make your model railroading fun, just as we’ve been since 1932. Be sure to visit walthers.com, and check out our monthly Walthers Flyer (available online and at participating dealers) and annual Model Railroad Reference Book for the latest Walthers products, as well thousands more items from our many suppliers.